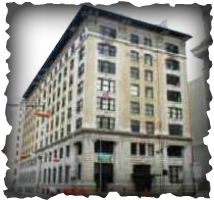 The Franklin Lofts building was originally the First National Bank built in 1905. It is 8 stories, with 62 units and 9 Penthouses. These downtown lofts range in size from 885 square feet to 2500 square feet. Conveniently located; Franklin Lofts are just steps from the Metro Rail. Amenities include: Controlled Access to building | Controlled Access and Assigned Parking | Porter | Rooftop Deck.